MADERA, CALIFORNIA (July 24, 2018) – The $5,000 to win Summer Speedfest 100 for the RPM Mortgage Pro Late Model Series at Madera Speedway is this Saturday night, marking the sixth race of the prestigious MAVTV-televised series. Clovis’ Austin Herzog and La Grange’s Matt Erickson are engaged in a heated championship battle that will come to a head in one of the biggest shows of the season. 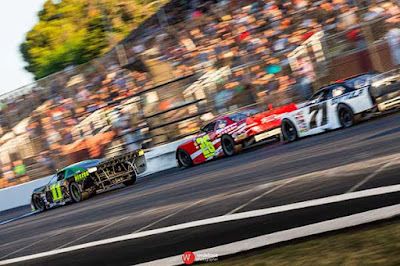 MAVTV-televised racing for the 51FIFTY Energy Drink Jr. Late Models and Mini Cups vs. Bandoleros along with Modified Super Toyotas are also scheduled to compete. Matt Erickson won the Reverend Ron Spencer Red, White, and Blue Classic on June 30th to extend his reign as the winningest driver in Madera Late Model history. His third win of the season also propelled him past $10,000 in winnings for the season and placed him just 12 points behind points leader Austin Herzog. Herzog, 15, has not won a series race but finished sixth in the standings in 2017 as the series Rookie of the Year. He also has six 51FIFTY Jr. Late Model wins on his resume. A third place place finish on June 30th gives him three consecutive podiums. Modesto’s Garland Tyler is third in the RPM championship ahead of Ryan Hart and May winner Racin Vernon of Bakersfield. Jason Aguirre won the non-televised Madera Late Model race on July 14th and was second in the last RPM race on June 30th as perhaps the driver with the most momentum this summer. The Summer Speedfest is a 100 lap feature with a scheduled break at lap 50. A 25 lap B Main is also scheduled, with the transferring cars moving on after lap 15. The final 10 laps is a run to a $500 victory for the highest non-transfer. Jesse Love IV is proving that his 2017 51FIFTY Jr. Late Model championship was no fluke, charging to his third victory of the year in June and leading the points by 23 over two-time 2018 winner Dylan Zampa of Napa. While these two have dominated victory lane, the battling behind them has been strong with Las Vegas’ Tanner Reif, Bakersfield’s Kabe McClenny, and Las Vegas’ Tyler Reif eager for their first wins. Third year drivers Austin Edwards and Lilly Mead trail them from sixth and seventh in the standings as well. Kayla Eshleman of Fontana has overcame low starting positions to put together four top-fives as well. The Jr. Late Models race for 70 laps on Saturday with a scheduled break at lap 40. Bakersfield drivers have set the standard in the inaugural Mini Cups vs. Bandoleros series. On the Bandolero side, Riley Massey and Zachary Ginn are at the top of the points with Massey grabbing two wins while Ginn has two runner-up finishes. 2017 Kern County Raceway Park champion Kercie Jung has two wins and a second in her limited schedule this year. Her teammate Seth Wise was the winner on the night she was in the runner-up position. In the Mini Cups, Bakersfield’s Kale McClenny has four wins to lead Madera’s Joseph Holliday in the standings. Jayce McArthey has also snagged a win this season. Modified Super Toyotas have been dominated by Ryan Reynolds who has built up a 36 point lead over Patrick Geiger. Bert Stephens, Dave Lander, and Shaun Reynolds round out a closely matched top-five. Action gets started on Friday evening with practice from 5 p.m. – 8 p.m. Saturday’s program begins with pit gates opening at 12:00 p.m. Practices run from 2 – 3:30 p.m. with qualifying and heat races to follow. The first set of main events starts at 5:30 including the Mini Cup feature and the Late Model B Main. Opening ceremonies are at 6:30 p.m.
Tickets for the Summer Speedfest are just $15 for adults, $13 for seniors, $7 for youth ages 6-12, and kids five and under are free! Madera Racing on MAVTV airs Thursdays re-runs of the 2017 season every week. The show airs at 5 p.m. and 8 p.m. PST and is also available on the Lucas Oil Racing TV app. Round #3 of the RPM Mortgage Pro Late Model Series airs on August 2nd.